Lions & penguins is one of our flagships. 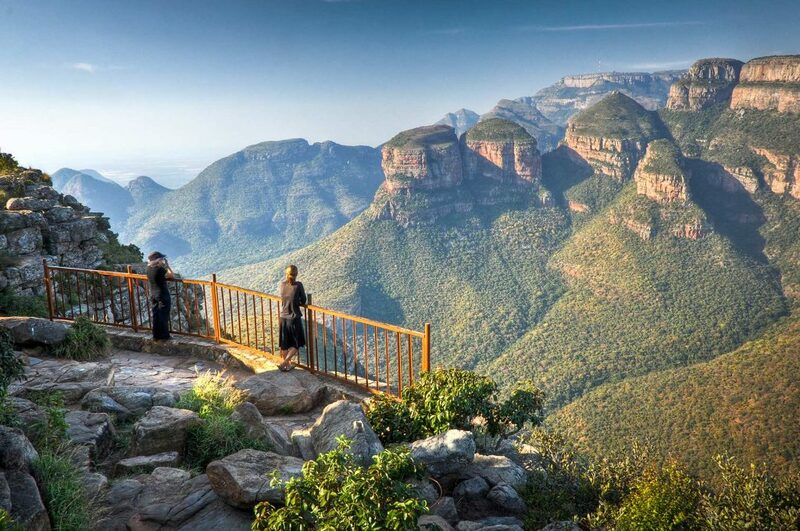 The ideal itinerary for first-time travelers to South Africa. 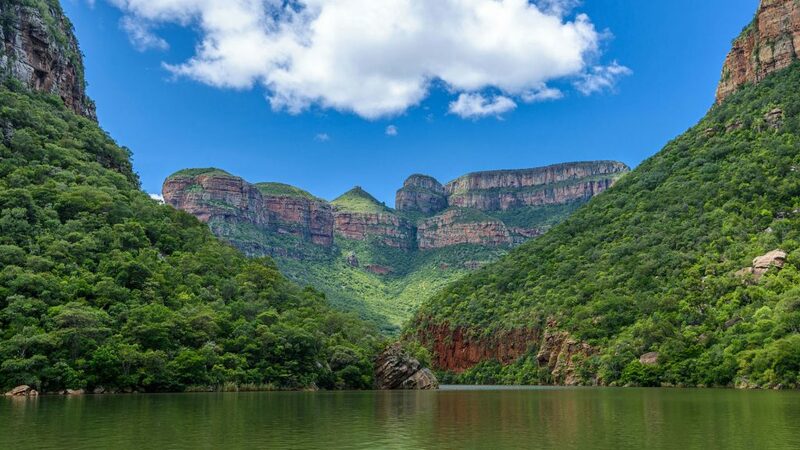 2) in the second part, you will be visiting the spectacular Blyde River Canyon, the Kruger National Park and Manyeleti, the wildest of all private game reserves open to Kruger. 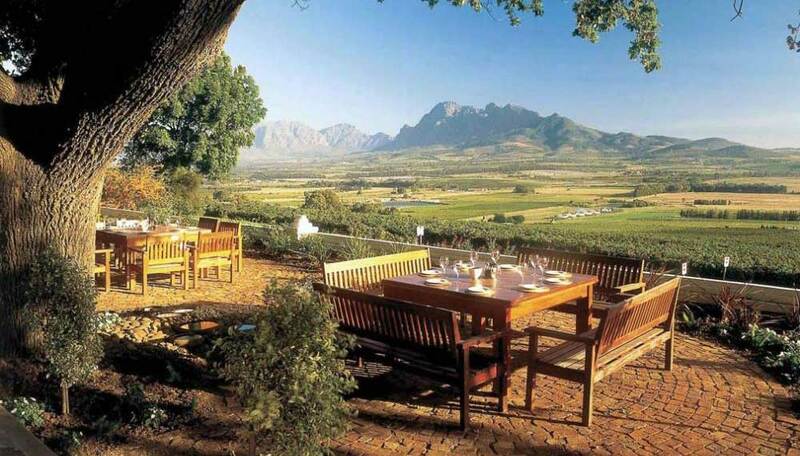 Accommodation: boutique guesthouse, boutique hotel or exclusive apartment in Cape Town; bush villa or lodge in Hoedspruit; bush camp in Manyeleti. Optional extensions: safari lodge in Sabi Sand or Klaserie, two of the most exclusive private reserves open to Kruger NP. 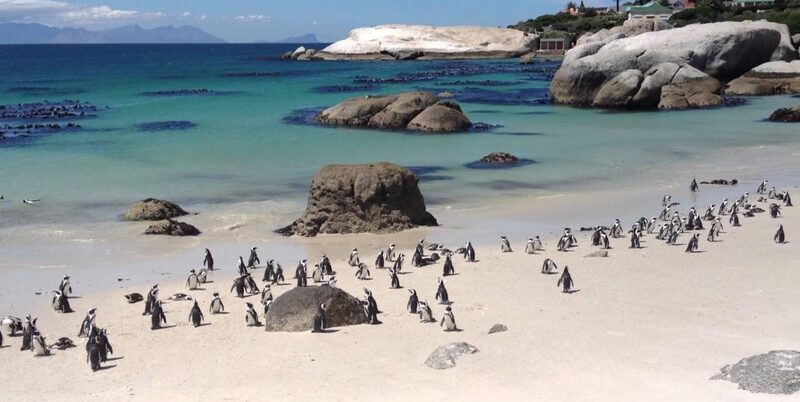 ⇒ May-September is low season in Cape Town. Some properties do offer a stay 4/pay 3 special. ⇒ June-November is whale watching season, with its peak from August to October. 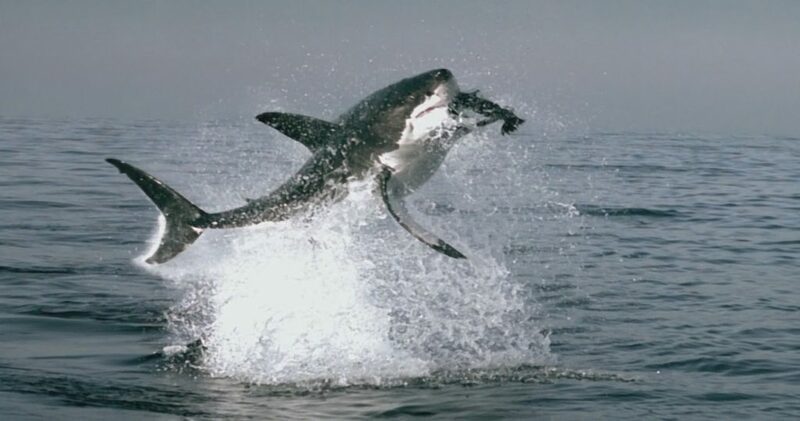 ⇒ May-September is the period of shark breaching. 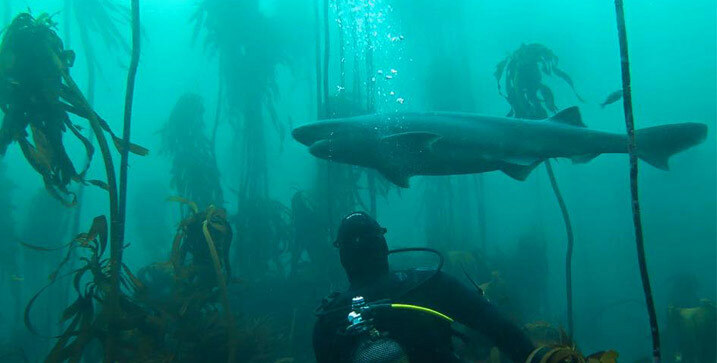 An incredible and unique natural show – with a bit of luck – occurring in the False Bay. ⇒ From August to September is the flowers season. 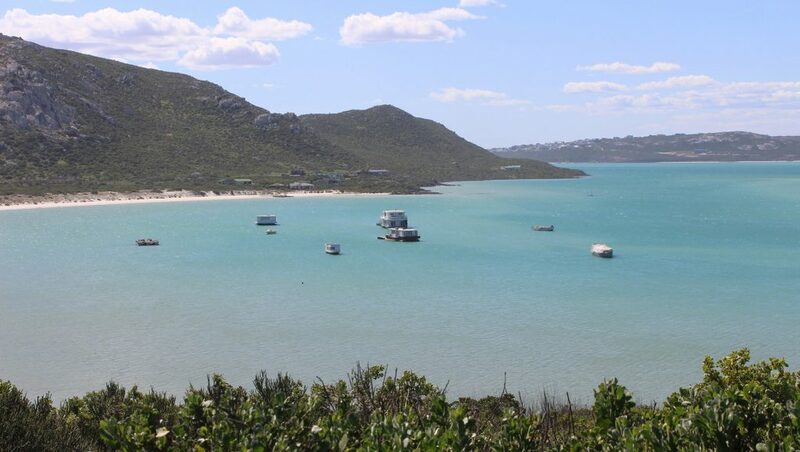 The colors you can admire in the West Coast NP are breathless, let alone the other gem of the park, the splendid Langebaan lagoon. 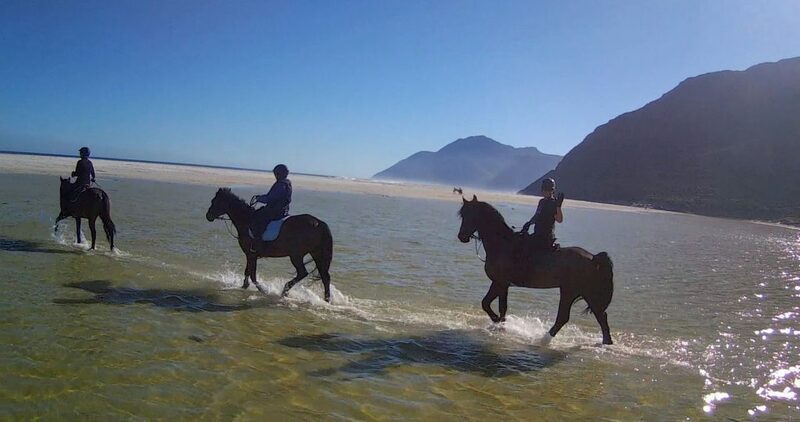 ⇒ During Christmas holidays, to find a place available in Cape Town can be a mission, if you didn’t book many months in advance. Last but not least, quite a few properties require a minimum stay of 7 nights. And the rates are, of course, the highest. 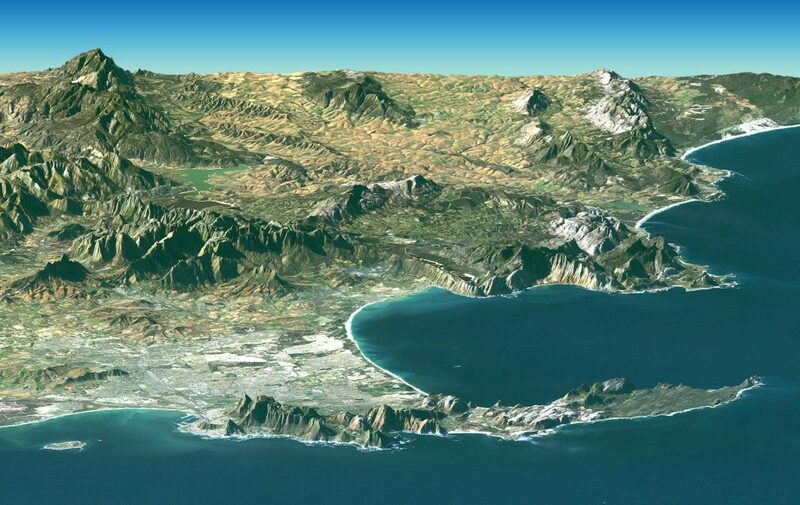 ⇒ From November until March, the weather in the Cape is usually great. Days are long and sunny, with very low chance of rain. 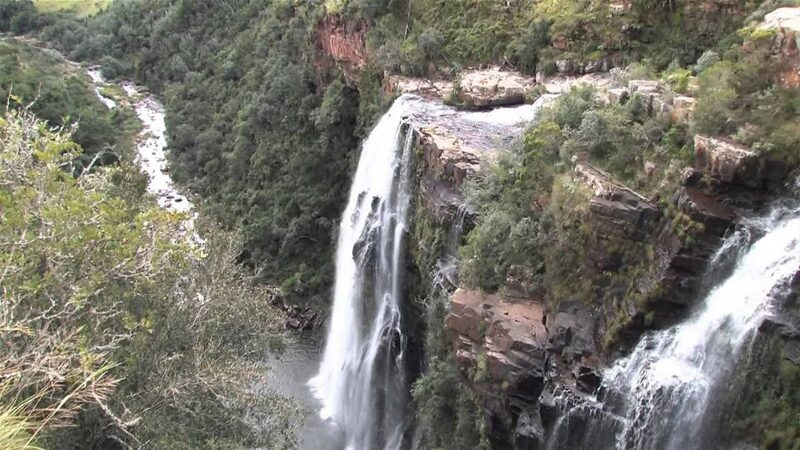 The same period is on the other hand the rain season in the Lowveld, although way less than one could expect. Rainfalls can be violent but usually short and quite often at night. 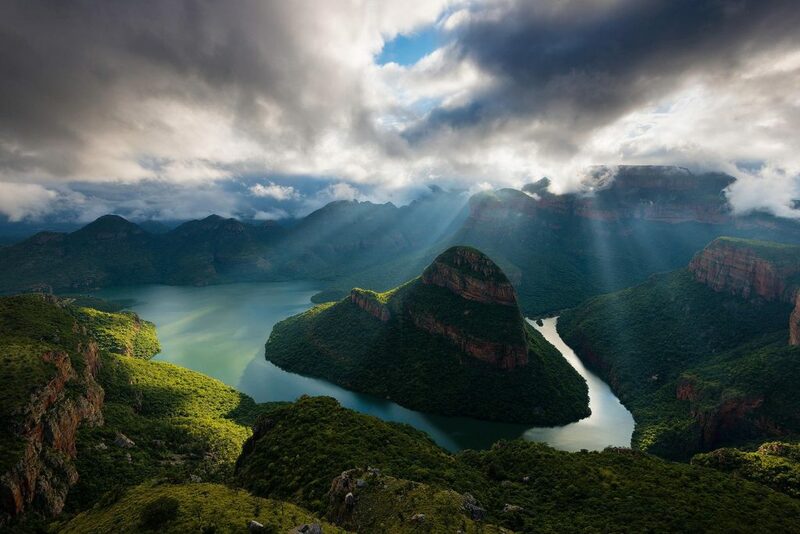 Blyde River Canyon: the third largest canyon of the world. 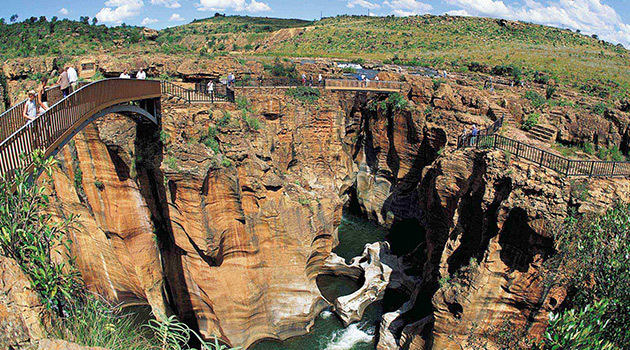 The best spots are Three Rondavels, Bourke’s Luck Potholes, God’s Window. Also recommended the boat trip in the heart of the Canyon. 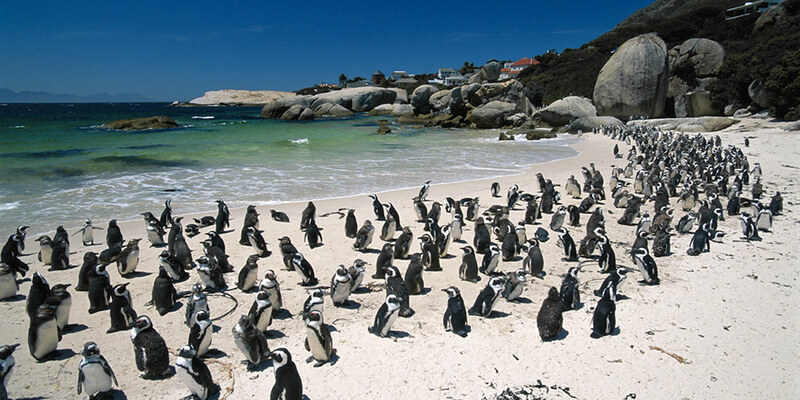 Cape Peninsula: see penguins on Boulders Beach and Foxy Beach. 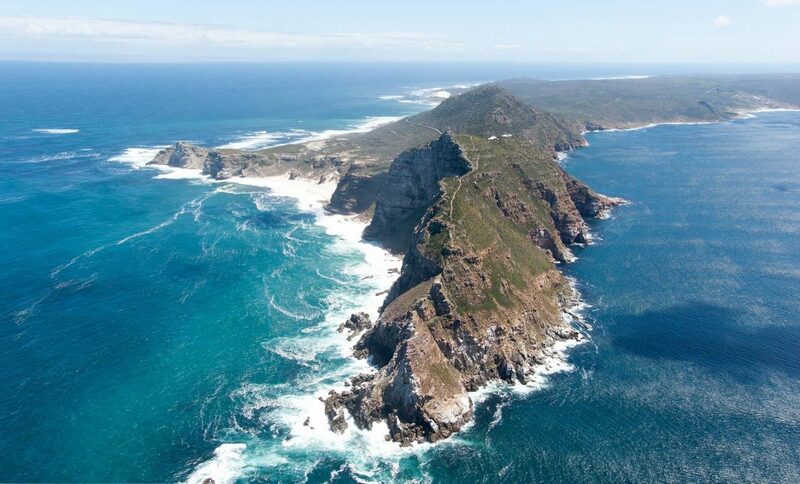 At a short distance, in the Cape Peninsula, the legendary Cape Point and Cape of Good Hope. 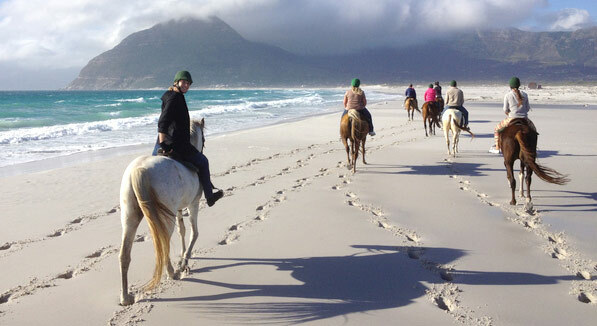 Excellent horse-back rides (also for beginners) on the beach of Noordhoek. 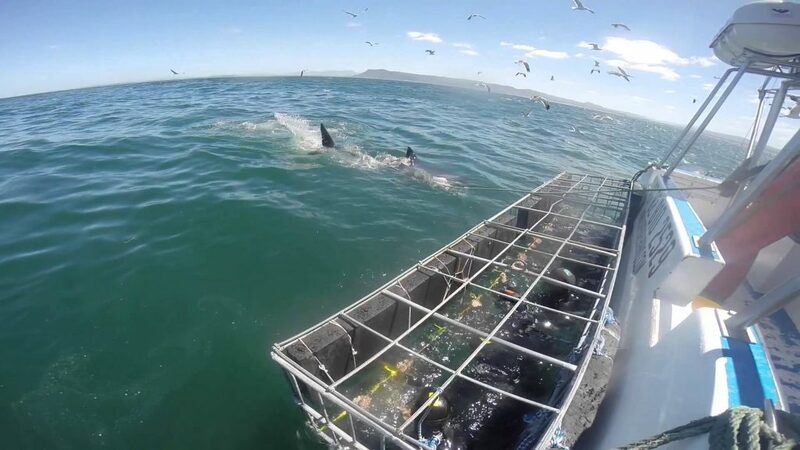 Boat trips from Simon’s Town off the coast in the hope to assist to the extraordinary shark breaching. 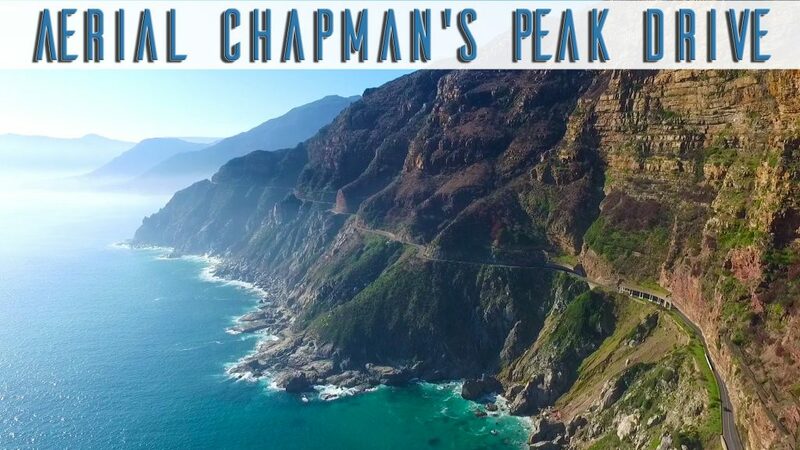 Drive along the Chapman’s Peak, one of the most scenic coastal roads of the world, connecting Hout Bay with Cape Peninsula. 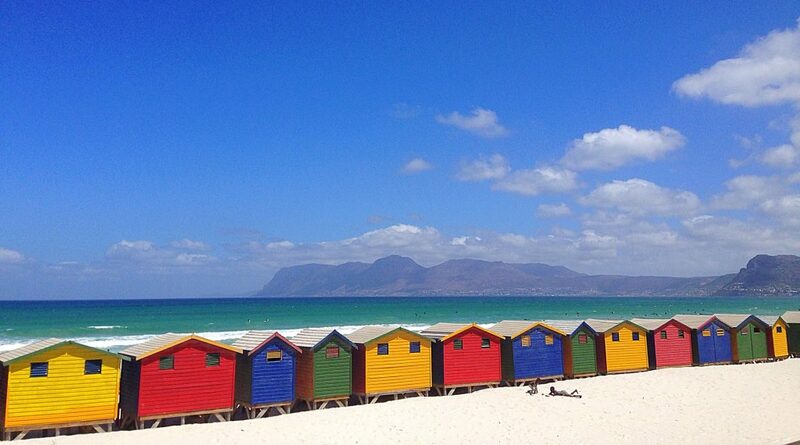 Don’t forget to photograph the colorful beach houses on the beach of Muizenberg. 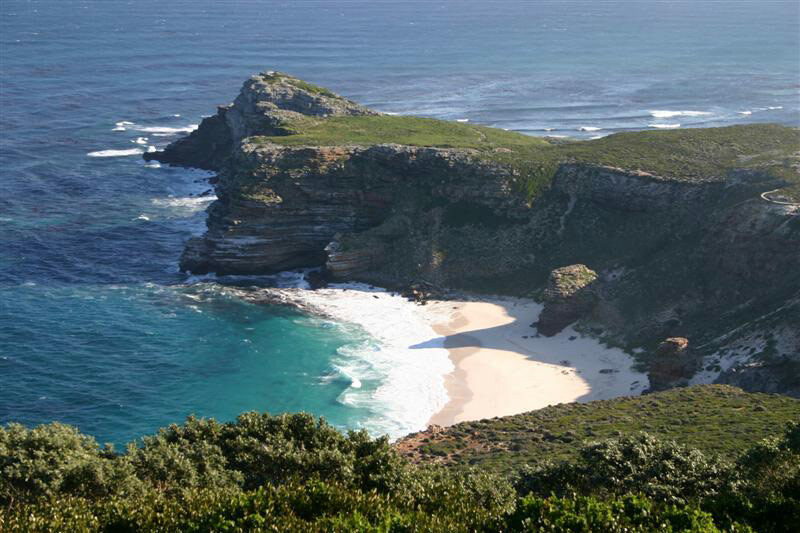 Cape Town: the beautiful beaches of the Atlantic Seabord (Clifton, Camps Bay, Llandudno). 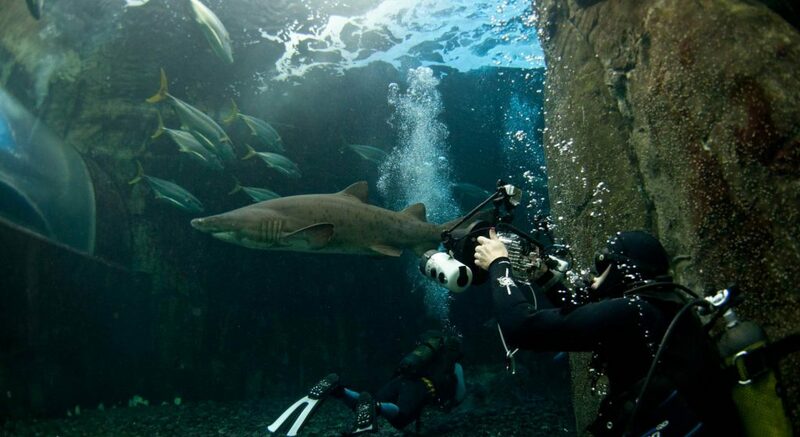 In the aquarium of the V&A Waterfront it is possible to dive into the shark pool and through the kelp forest. 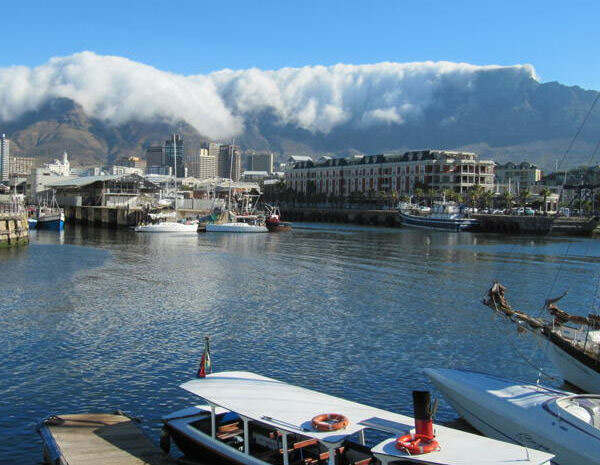 The iconic Table Mountain overlooks the mother city and the Cape Peninsula. 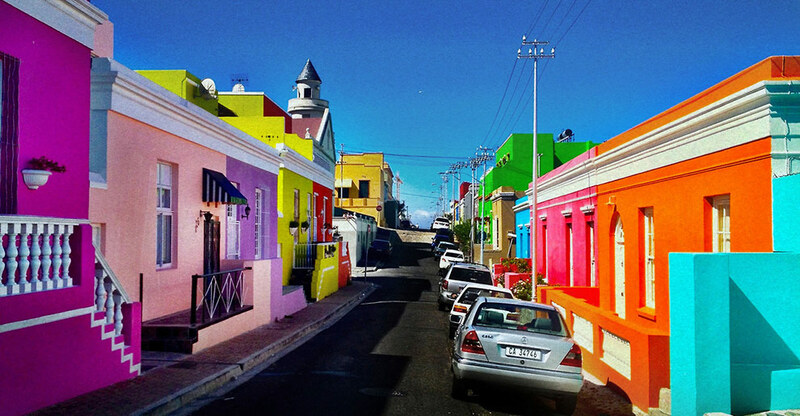 The charme of the cobble stones narrow streets of the picturesque Bo-Kaap. The beautiful botanical gardens of Kirstenbosch. Candle-lit dinners in the old fishing village of Hout Bay. 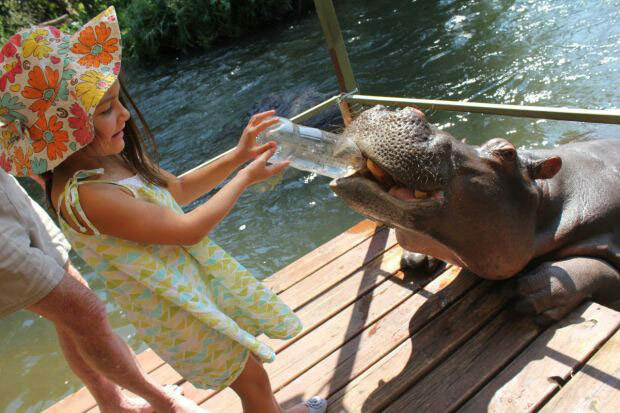 Hoedspruit: visit the world star Jessica the Hippo, the main character of several TV documentaries. 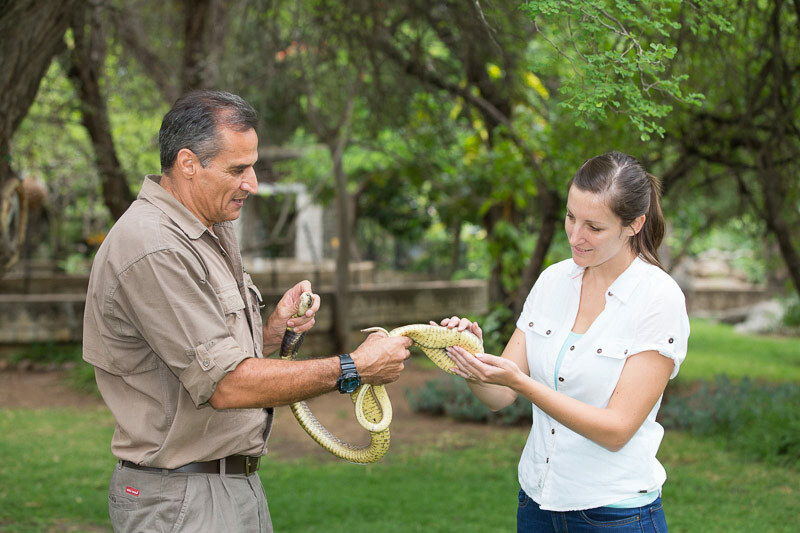 Visit the Kinyonga Reptile Centre, to discover the secrets and get rid of irrational phobia and false myths of the fascinating world of reptiles. 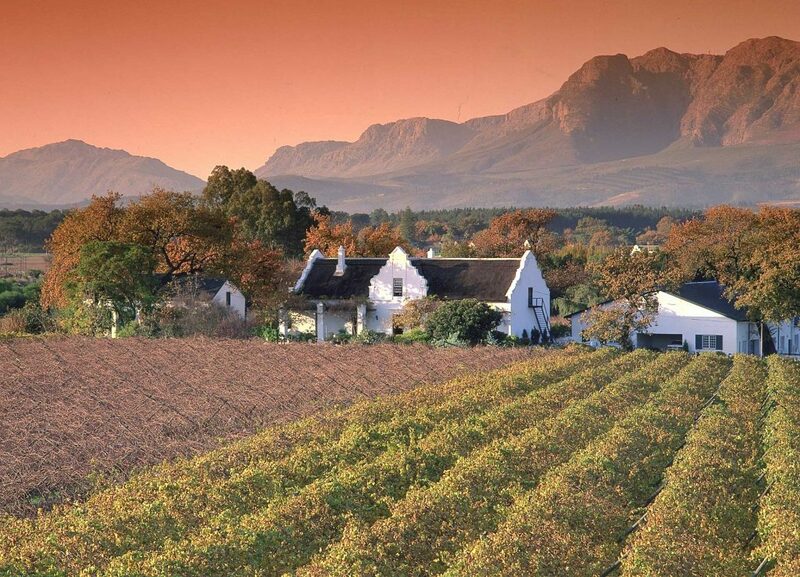 Winelands: taste delicious wines and enjoy the great cuisine of the wine farms of the Cape. 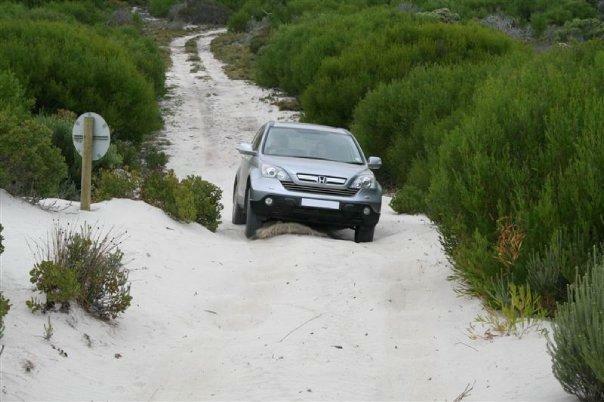 4×4: drive through the grassland of the Mananga Trail, near Satara (Central Kruger) or tackle the sand tracks through the fynbos of the Walker Bay Nature Reserve. 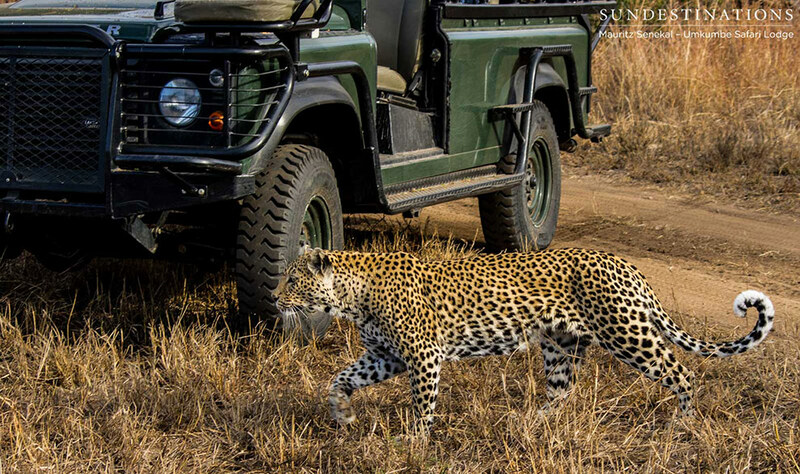 Safari: self-drive through the “feline area” between Orpen and Satara, in Central Kruger; guided game drives by open vehicles in the wild Manyeleti Game Reserve; night drives in Kruger NP, with bush braai under the stars. 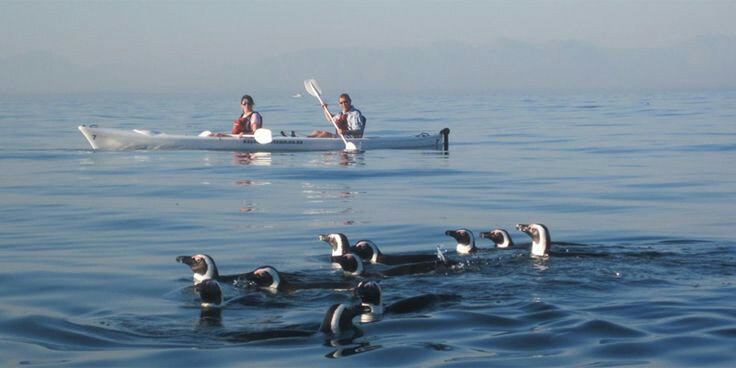 Sea-kayaking: paddle from the False Bay to Cape Point, or in the Walker Bay (from Hermanus) for a close encounter with dolphins and whales. 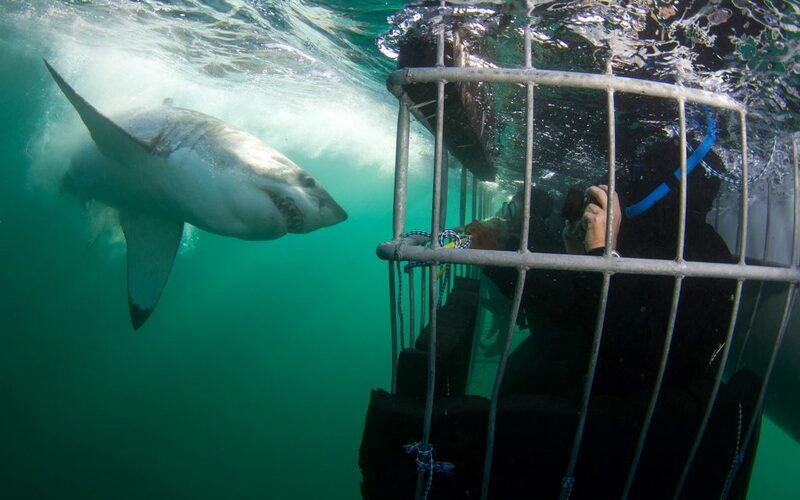 Shark cage-diving: the best is from Gansbaai, but this is also possible from Simon’s Town, in the False Bay. 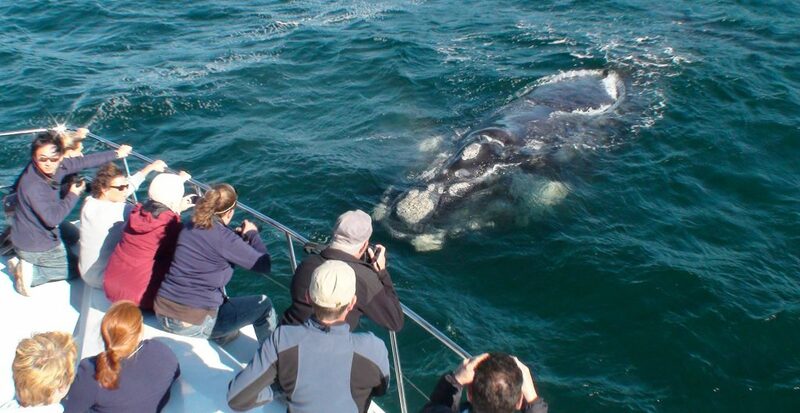 Whale watching: from June until November from the cliffs of the Walker Bay (Hermanus), or by boat from Gansbaai. This being a self-drive itinerary, please consider the following day-by-day programme as a mere suggestions. Also bear in mind that this trip can be done, on request, with a private guide. 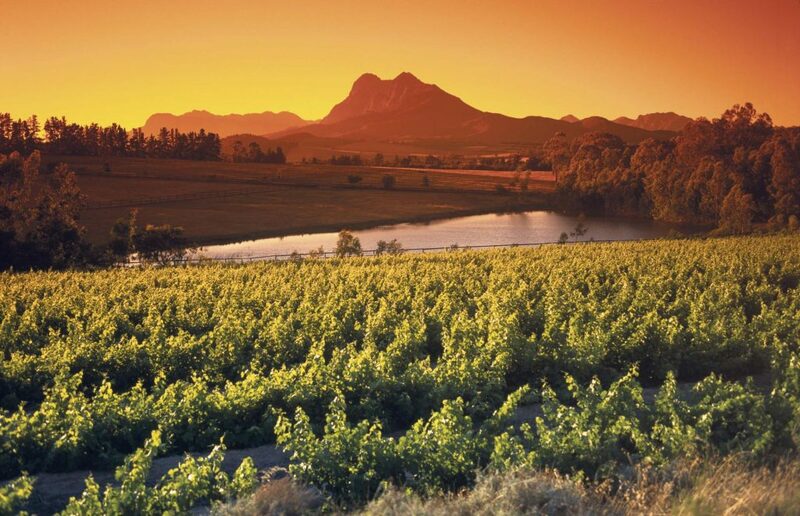 Days at leisure to explore the Cape region. 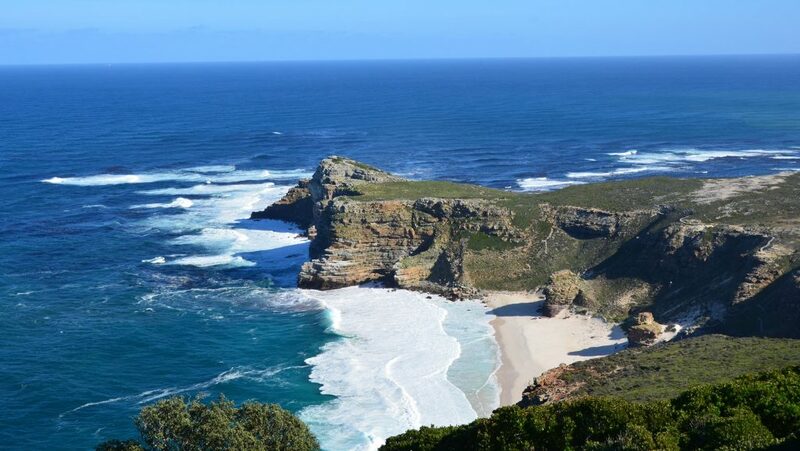 Not to miss the visit of the Table Mountain National Park: the Table Mountain itself, the penguins of the False Bay, the Cape of Good Hope and Cape Point in the Cape Peninsula. 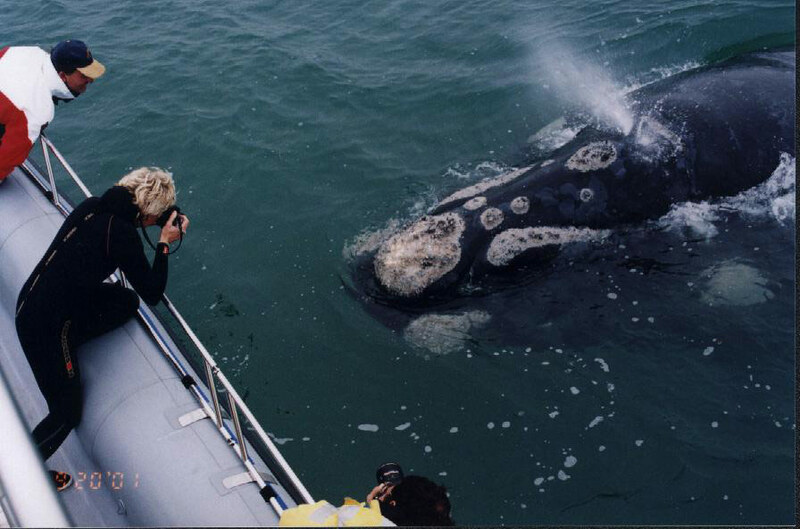 From June to November, excellent whale watching by boat from Gansbaai. 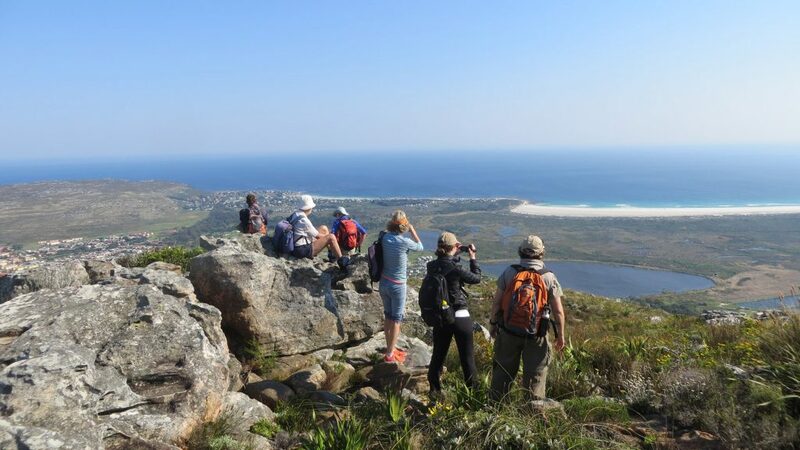 Whale spotting is also possible from the walking path along the Walker Bay in Hermanus. August and September are the months of flowers blooming. 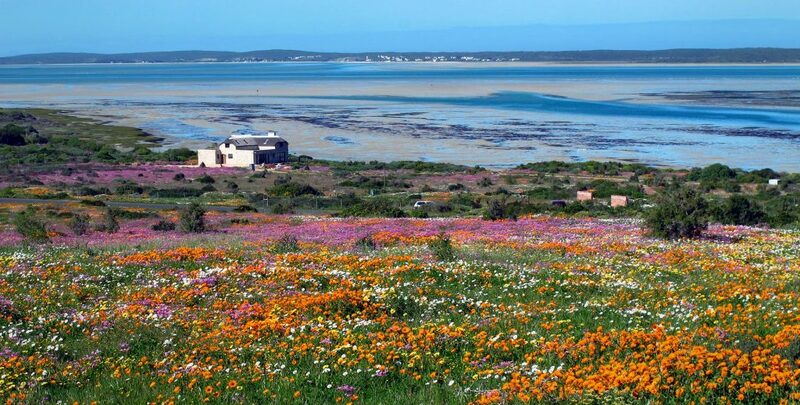 In the West Coast National Park, the Postberg section opens to the public, showing a carpet of flowers with herds of different species of antelopes and mountain zebras grazing and browsing free. 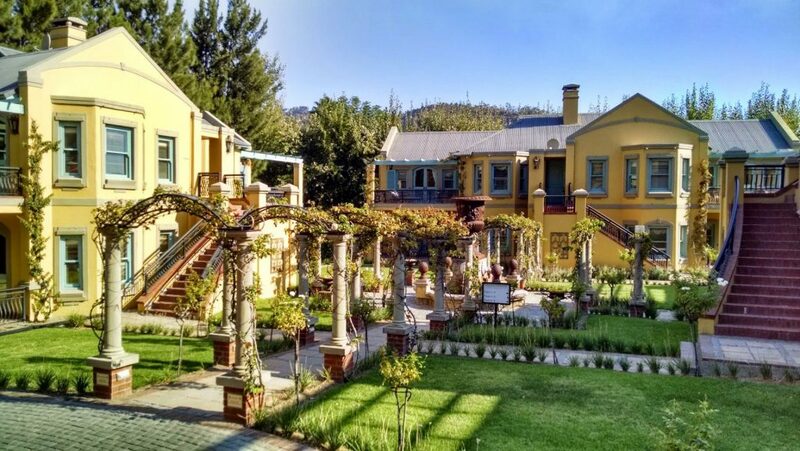 For the lovers of gourmet cuisine, the Winelands cannot be missed. Of the beautiful beaches of the Atlantic Seabord, Llandudno is the best for sundowner. Don’t miss the colorful Bo-Kaap, the peaceful avenues and streets of Gardens, the shops and restaurants of Seapoint and the V&A Waterfront. Accommodation in boutique guesthouse with breakfast included or in luxury apartments (only bed) in the Waterfront Marina. 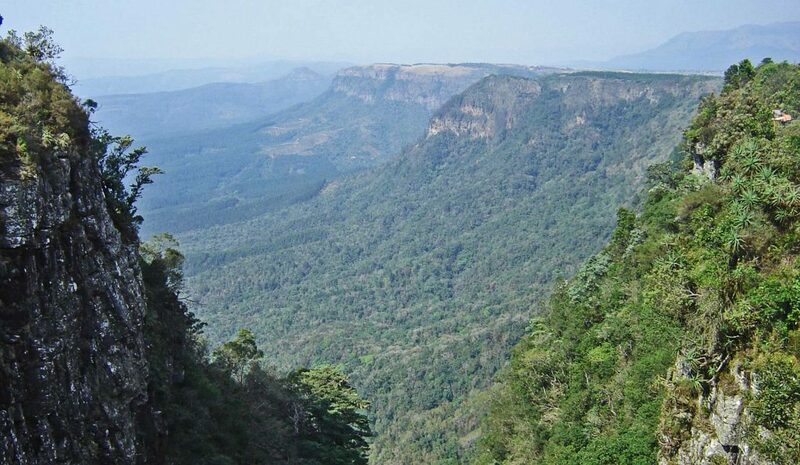 Flight to Nelspruit (in the morning of day 5), pick-up of your vehicle at the airport and drive to Hoedspruit (2 hours ca.). 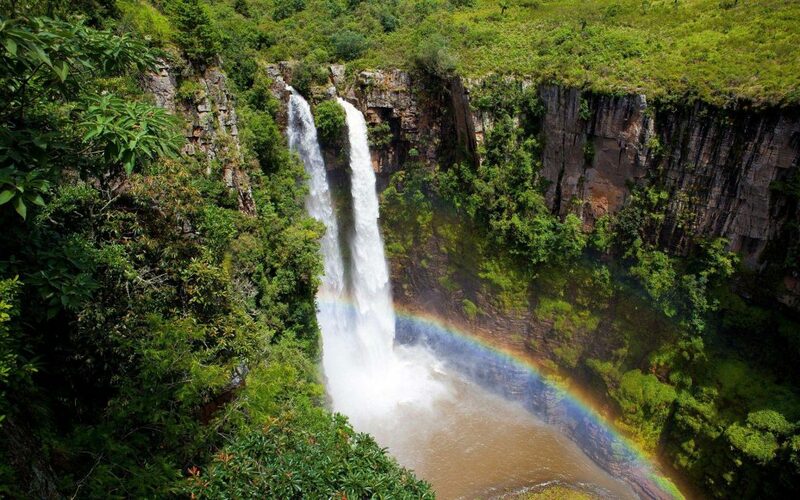 The two remaining days can be spent to visit the Blyde River Canyon and the Kruger National Park. Hoesdpruit‘s most popular attractions are the world star Jessica Hippo and the famous Kinyonga Reptile Centre. You can also book morning or afternoon game drives in some of the nearby private big 5 reserves like Makalali, Timbavati or Klaserie, followed by breakfast or dinner. And, last but not least, why not getting a full body massage in the bush? Accommodation in a charming bushvilla a few steps away from the Blyde River or at the African Rock Lodge, in both cases with breakfast included. Guided game drives in the wildest private reserve open to Kruger NP. Overnight in bush camp hidden in a thick bush (Ndzaka) or set in an open savannah (Buffelshoek). Both bush camps are unfenced and with no power, with lanterns and torches adding romance. Full-board and 4 guided game drives open safari vehicle. Last game drive in the morning, return to the camp for brunch and check-out. 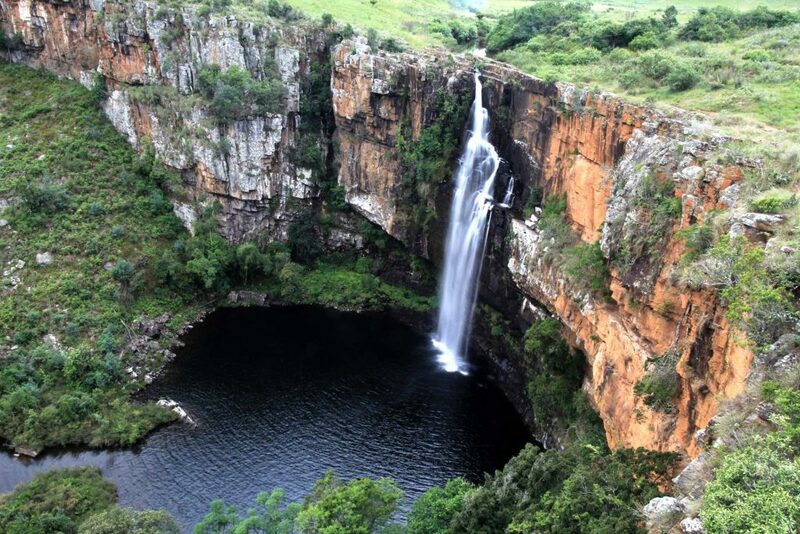 Transfer to the Mpumalanga International Airport of Nelspruit, return of your vehicle and embark on the flight to Johannesburg. Sabi Sand is arguably, with Mala Mala, the most exclusive private reserve of South Africa. Amongst the many options, Notten’s Bushcamp is perhaps the one by the best value for money. The real luxury is the romance of its atmosphere, where candle lights, oil lanterns and open fire do replace electricity. Ideal for couples and honeymooners. Great setting, in one of the areas wth the highest density of leopards. Being often fully booked due to its high popularity, it is recommended to avoid late bookings. A cheaper alternative option is Umkumbe Safari Lodge, 10 rooms / chalets, on the edge of the Sand River, a good location from where to spot hippos, elephants, ippopotami, elefanti and other wildlife. from one’s own veranda. Accommodation in superior room. The Klaserie Game Reserve is open to Kruger NP and borders with the more famous Timbavati Game Reserve, with only a small road in between. nThambo Tree Camp and Africa on Foot are the 2 lodges we recommend. The first is made of large tents raised on wooden platforms and overlooking an open grassy savannah; the latter is a bit more rustic and cheaper, but offers the chance of walking safaris in the morning, with game drives in the afternoon. Daily departures on request, rates valid until 30/09/17. 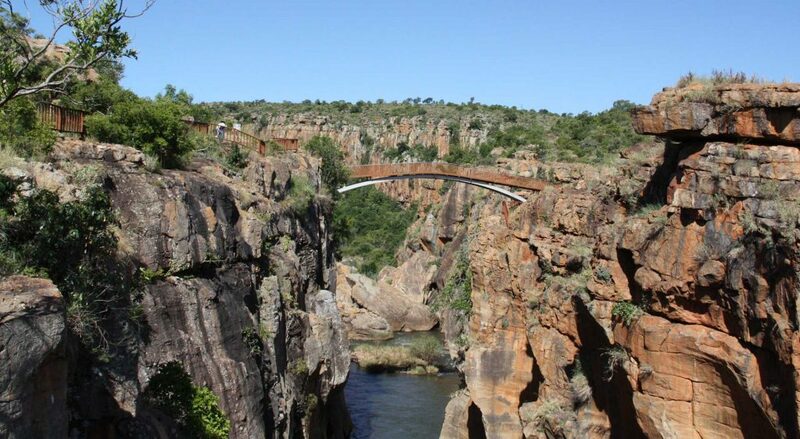 Flight Cape Town-Nelspruit + Nelspruit-Johannesburg. 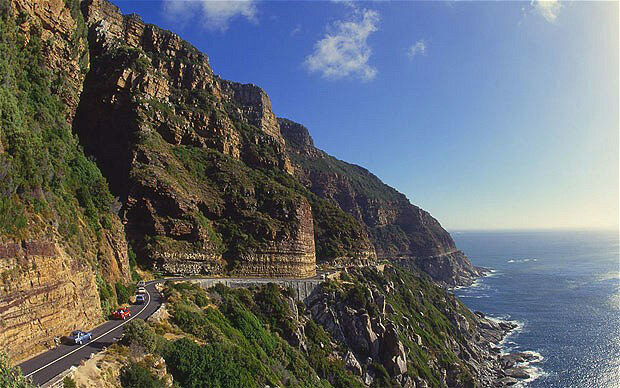 4 nights at Ocean View House in Cape Town (BB). 3 nights in bush villa in the Balule Game Reserve (BB). Complimentary welcome braai + 1 game drive at Balule. 2 nights in bush camp in Manyeleti (FB). 4 game drives by open vehicle in Manyeleti. Car rental (Toyota Rav 4 or similar) with unlimited mileage and total cover insurance. Dossier with full directions and travel tips. 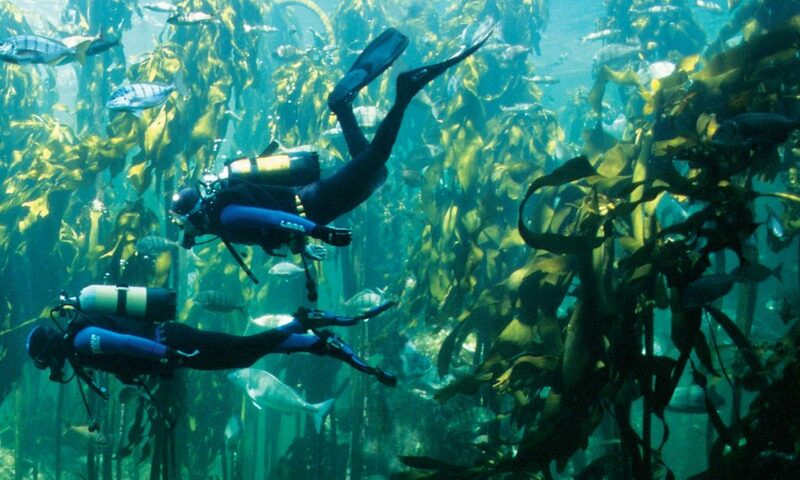 Meals and activities in Cape Town. 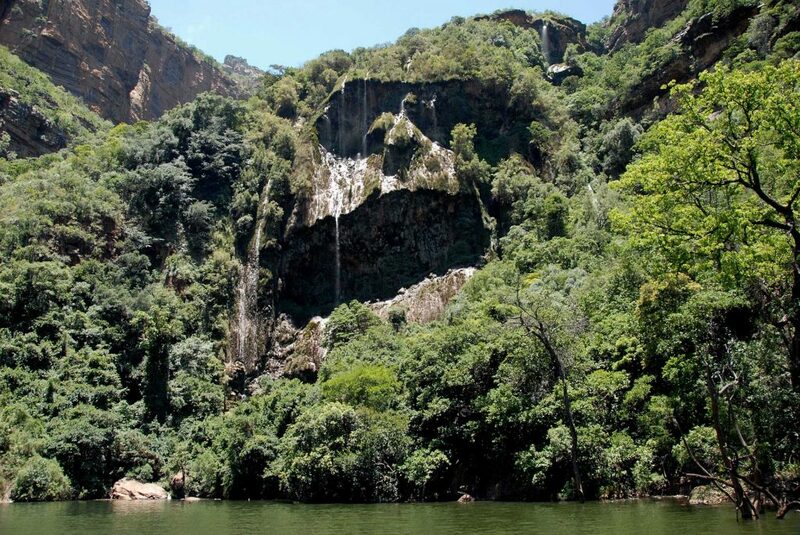 Meals and activities in Hoedspruit (except what mentioned as included). 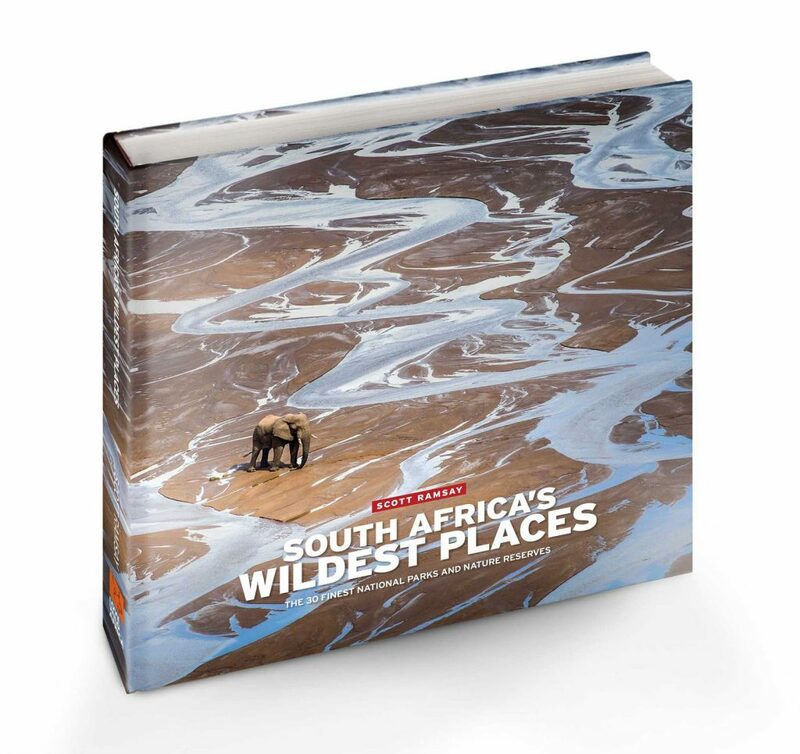 The cover of Ramsay Scott's new photographic book, South Africa's wildest places. 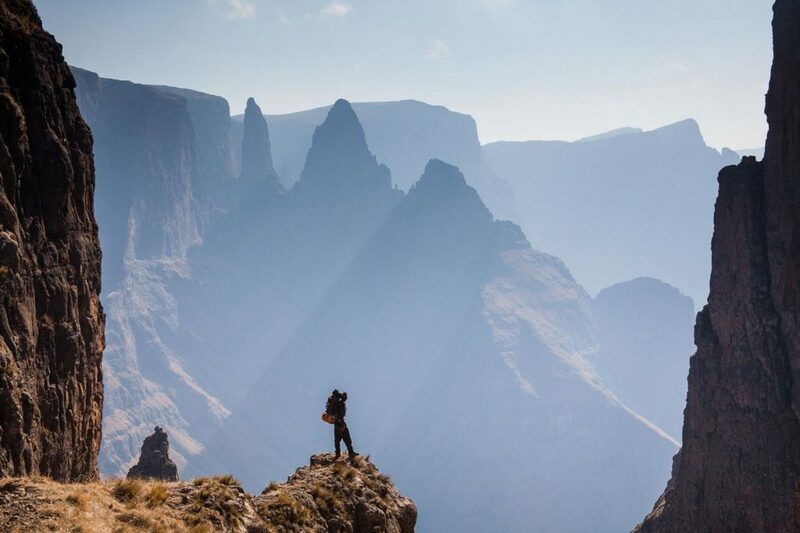 Breathtaking view over the Drakensberg Mountains. Inspiring and soul reawakening. 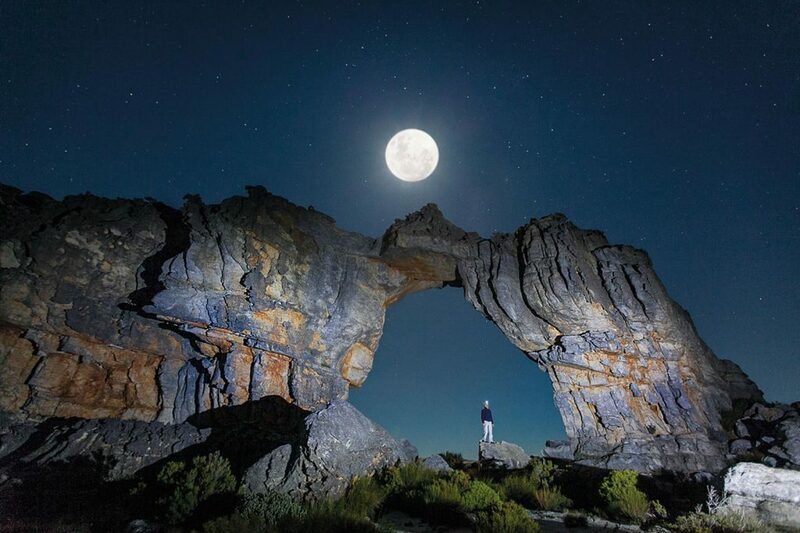 The Wolberg arch, in the Cederberg, a few hundreds km north of Cape Town. With the full moon and Milky Way's beam, this natural scultpure, with a height of 28 meters and a width of 68, seems to be a gate to another universe. 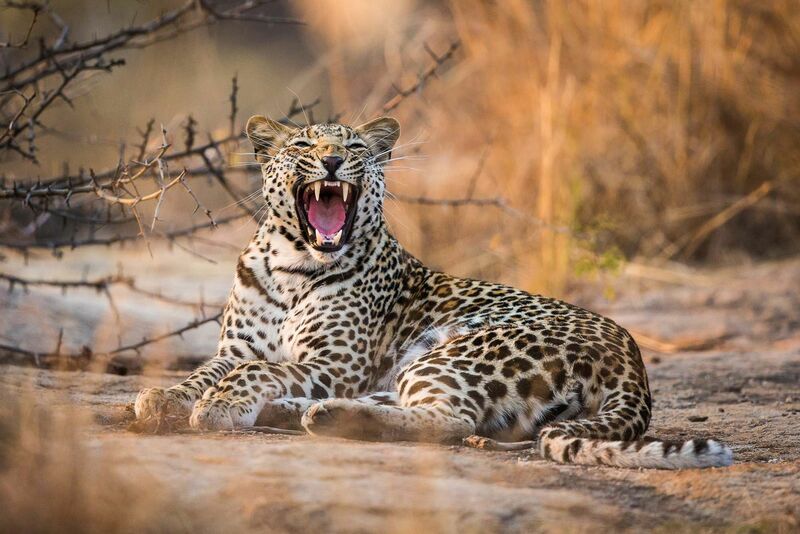 A leopard female, shot at sunset in the Kruger National Park. South Africa is perhaps the country with the highest density of this beautiful cat. 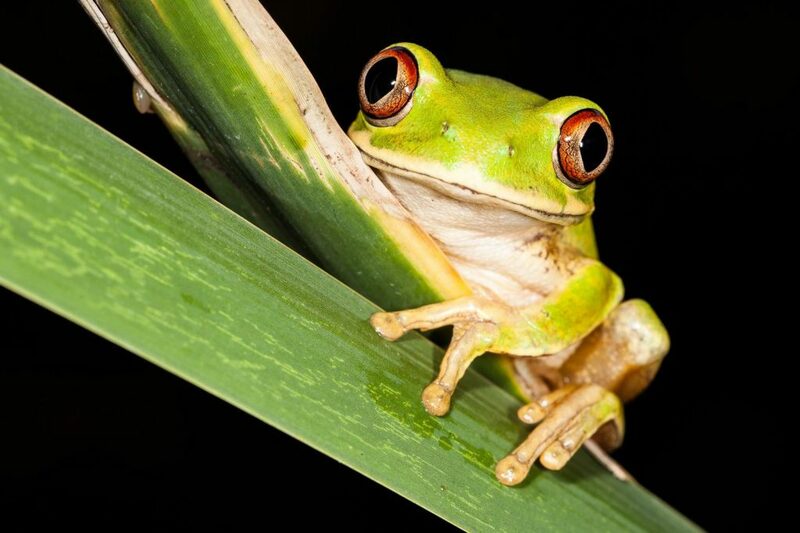 A Natal tree frog in the Isimangaliso National Park. These amphibious are extremely useful in taking under control the number of anopheles mosquitoes, responsible for malaria disease in Africa. 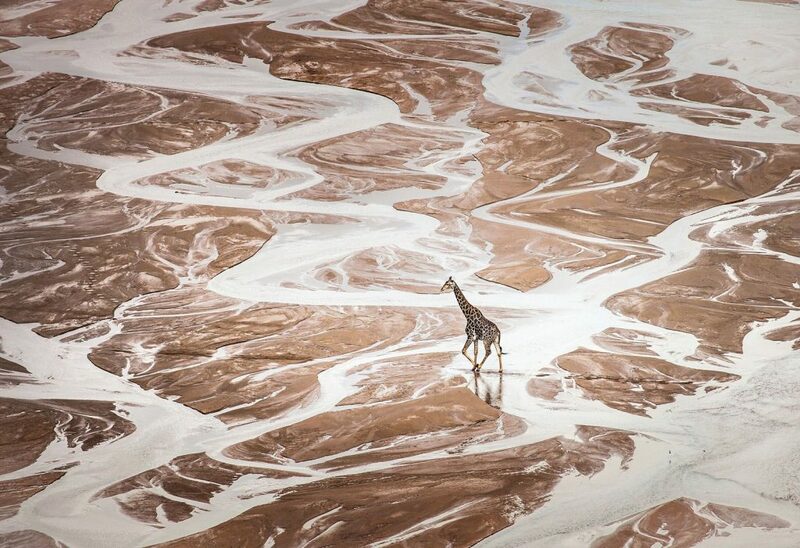 A giraffe crossing a dry river bed in the Hluhluwe-Imfolozi Game Reserve. This photo exudes a strong solitude feeling. Of the over 2 million specimens who were roaming the African plains one century ago, only 80.000 are left today. 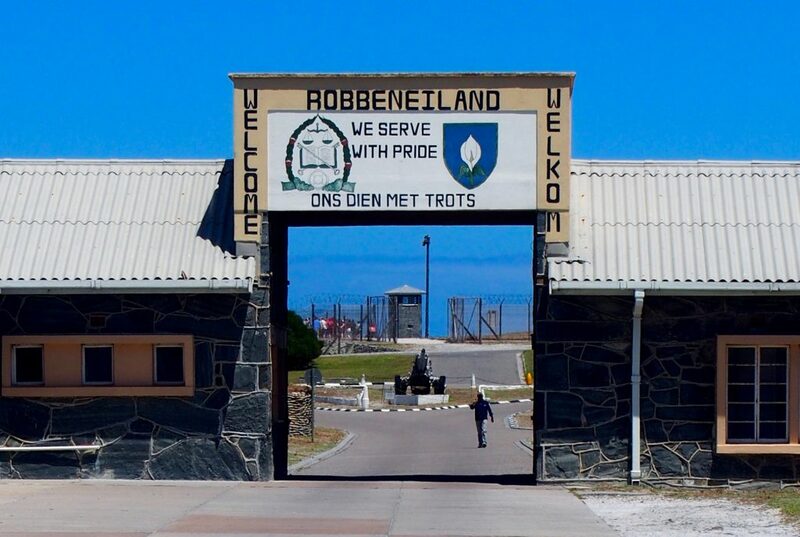 An icon of a little known African tragedy. 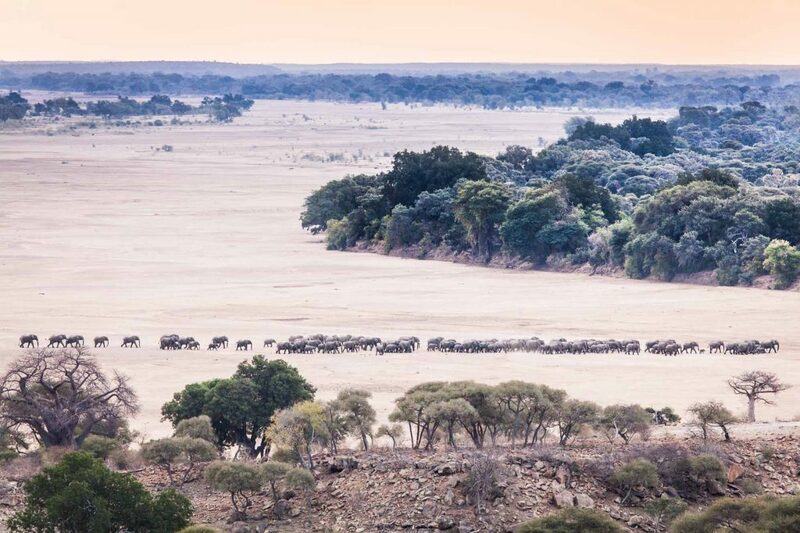 A breeding herd of some 90 elephants crosses the corridor at the confluence of the Sashe and Limpopo river, in the Mapungubwe National Park. 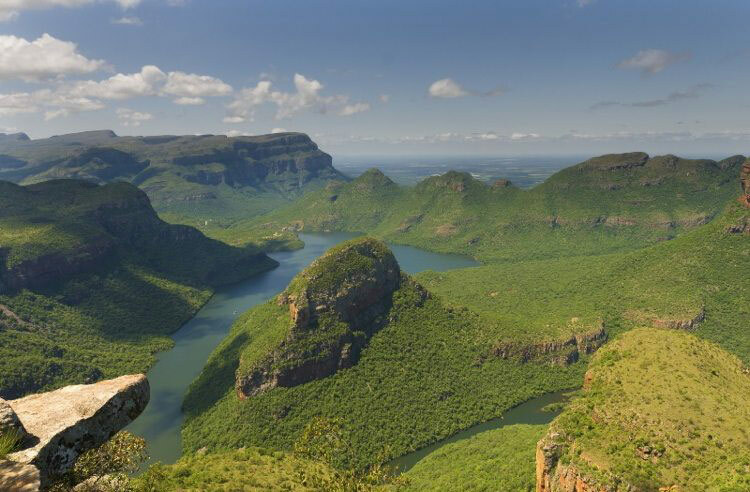 A huge wilderness shared by South Africa, Botswana and Zimbabwe. 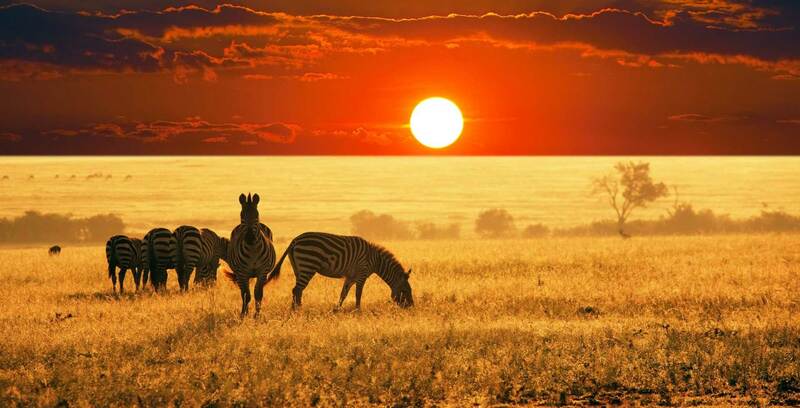 Transfrontier parks are the ultimate resort for the sake of the African wildlife. 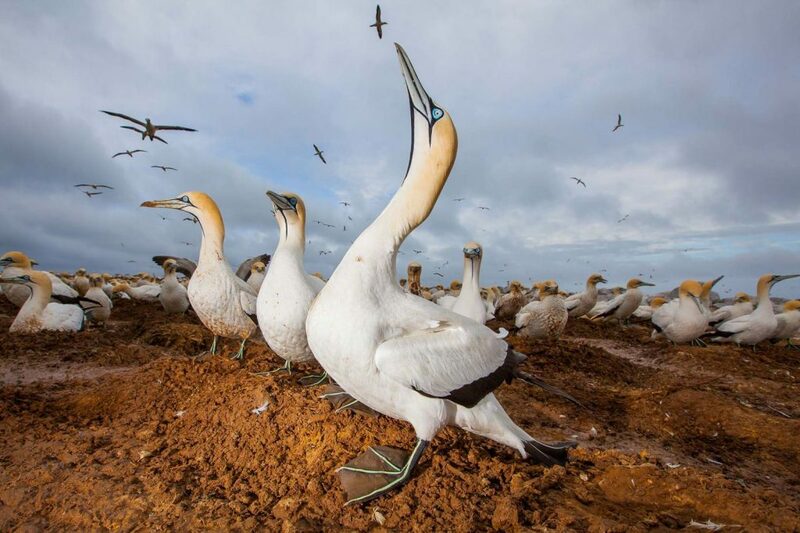 The 30.000 breeding couples in the West Coast National Park, account for the most abundant colony of Cape Gannet in Africa. Their number has been decreasing by 50% over the last decades, due to the strong competition with fishermen with regard to sardines hunting. 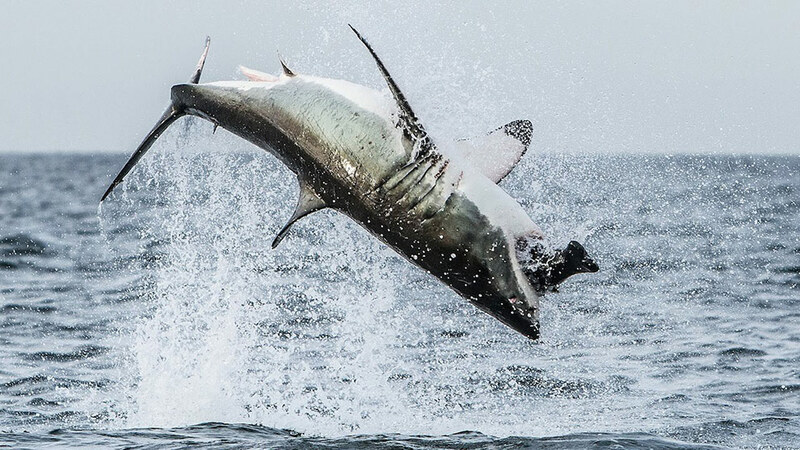 They can fly 500 km a day! 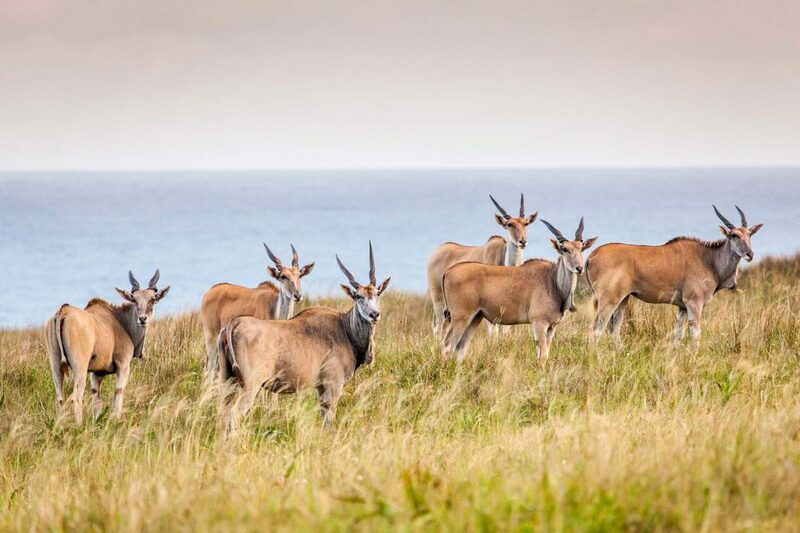 A herd of eland in Mkambati Nature Reserve, in the Wild Coast. The eland is the largest of African antelopes (a fully grown male can weigh almost as much as 4 male lions) and was considered as a sacred creature by the bushmen, as witnessed in many of their rock carvings. 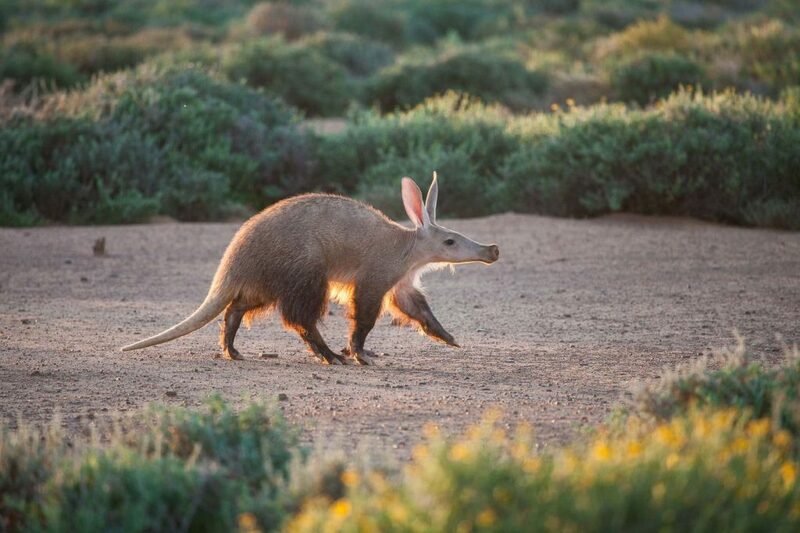 A rare diurnal photo of an aardvark, in the Tankwa Karoo National Park. This formidable ant-eater is active mostly at night. 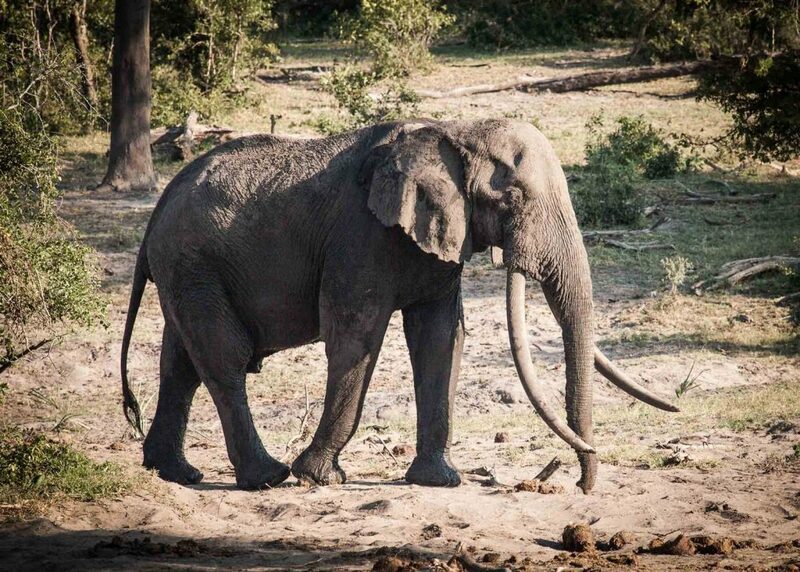 A big tusker of the Tembe Elephant Park, near the border with Mozambique. This big 5 reserve is home to elephants with a special gene, giving to many of them this distinctive feature. Such a great and locally concentrated gene for ivory, does explain why the anti-poaching units of Tembe have a name for great efficiency.